Get full spectrum support for bone, muscle and heart health with Kal's Magnesium 400 mg Hydroxy Acids with Orotates. Magnesium is one of the most important minerals for comprehensive health and wellness. It supports hundreds of reactions and functions throughout the body and encourages optimal bone growth and cardiovascular health. Kal's Magnesium 400 mg Hydroxy Acids with Orotates is formulated with a hydroxy acid magnesium complex in an ActiSorb base. It's designed to deliver highly bioavailable magnesium support for the areas where your body needs it most. 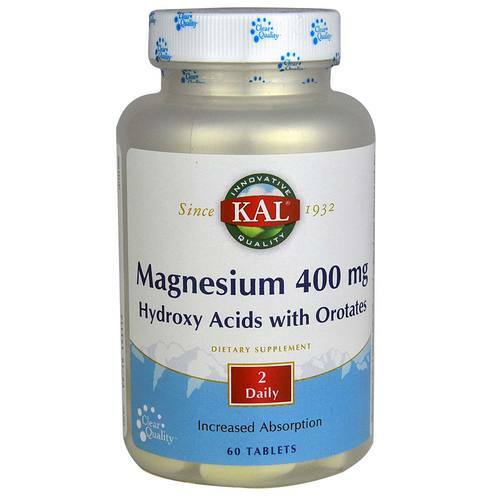 Magnesium 400 mg Hydroxy Acids with Orotates is from Kal's line of superior mineral supplements. Order yours today at eVitamins! Recomendações de uso: Take 2 tablets daily with a meal or glass of water.